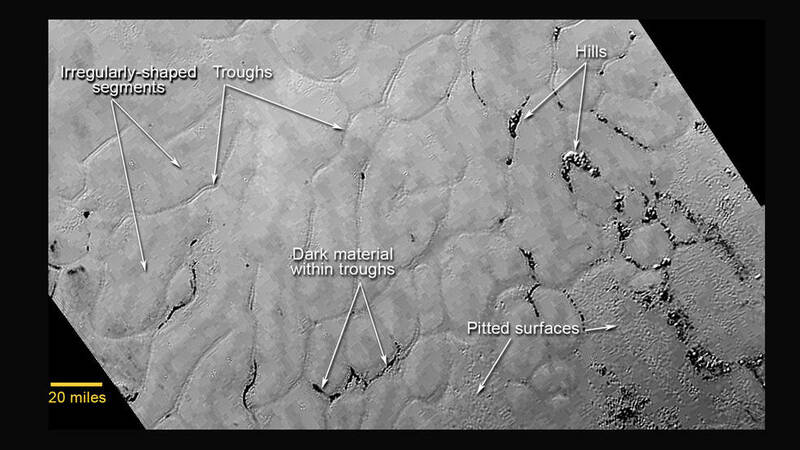 July 20, 2015 – In the data from NASA’s New Horizons spacecraft, a close-up image of Pluto reveals a vast, craterless plain that appears to be no more than 100 million years old, and is possibly still being shaped by geologic processes. This frozen region is north of Pluto’s icy mountains, in the center-left of the heart feature, informally named “Tombaugh Regio” (Tombaugh Region) after Clyde Tombaugh, who discovered Pluto in 1930. New Horizons is the first mission to the Kuiper Belt, a gigantic zone of icy bodies and mysterious small objects orbiting beyond Neptune. This region also is known as the “third” zone of our solar system, beyond the inner rocky planets and outer gas giants. APL designed, built and operates the New Horizons spacecraft, and manages the mission for NASA’s Science Mission Directorate in Washington. The Southwest Research Institute leads the science team, payload operations and encounter science planning. New Horizons is part of the New Frontiers Program, managed by NASA’s Marshall Space Flight Center in Huntsville, Alabama.